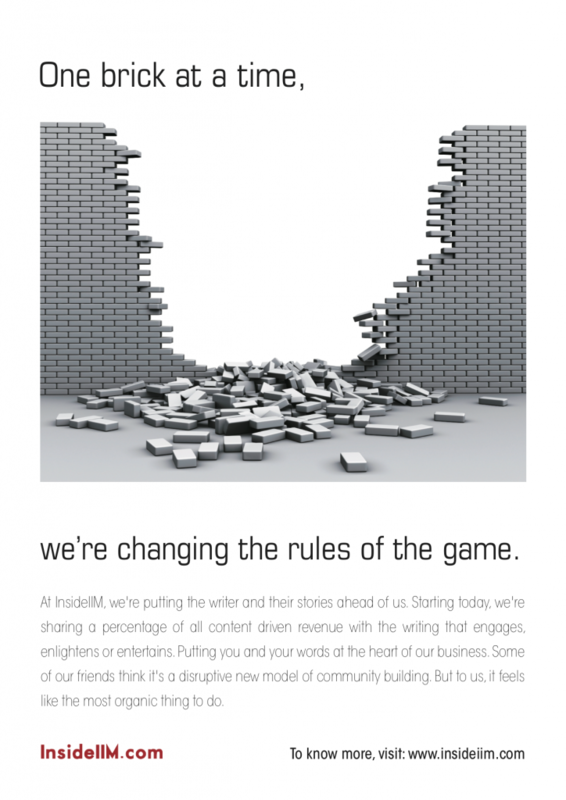 Write Stories : Now, share InsideIIM.com’s revenue through your Tales! It is time now to encourage you to write stories. It is also time to start making you a participant in the future creation of this platform. We have decided to start sharing content based revenues with our story-tellers! It is our long-term goal to see a day when the entire community not only shares revenues but also owns the entire platform. Schools, students, alumni, professors, companies all become partners and owners of this platform. From Dec 2013, we will do a 3 month trial of this concept. We have earmarked a fixed sum of money from our revenues for this purpose. Story-Tellers will become eligible for this kitty based on the popularity and utility of their content. For the month of December we will share the kitty among the top 10 Writers/Story-Tellers/Content Creators based on popularity of their creation. The top 10 will be decided based on a score calculated based on Unique Visitors (as the primary metrics), social media virality, and editorial rating. We will announce the exact formula soon but the underlying message is simple – Create something useful for the community and you will be rewarded by the community! You become eligible for it only if your single piece of content is visited by over 1000 unique people and the average time on page is greater than 30 seconds. Team InsideIIM will NOT be eligible for this. Story-tellers on our paid roster and interns only become eligible after 2000 unique people have seen their stories. The current arrangement with them will have no change. All stories can be in any form – Video, Audio, Images or Text or a combination of all 3. Plagiarised content will be deleted from the platform and the user will be banned. All content needs to have proper references or links given for sources. Photos should be original or from under the Creative Commons license only. All writers need to have a bank account in India and a PAN no. All payments will be made via Cheque/NEFT transfer only. Please note that this 3 month period is a trial. We will take feedback from all stakeholders and continuously improve the system. Register and Start Writing Now! Since time immemorial, humans have spread and passed on knowledge through a simple and effective tool – A Story. If you look around you, you’ll realize all we do is tell each other stories. The backbone of our learning is Tales and Stories passed on from one generation to another. Stories ignite curiosity. Stories make learning simple. Stories make interactions interesting. Stories are omnipresent in our schools, colleges and universities. Stories have shaped us. It was a story when the brilliant case study was discussed by the professor and it was a story that cracked you up when your friend narrated that humorous incident from his life. It was story when Manjunath Shanmugam inspired you. It was a story that excited you when you decided to work for a start-up instead of the 6 figure salary offering job. It was a story when you learnt life skills by just being on campus for all those years. At InsideIIM.com, we have been creating Stories for you over the last 2 years. Some call it articles, some call it posts. Some call the sum total as content. Ultimately, all of it are Stories. Through our stories, we have helped hundreds of students take the right calls, be more informed, open themselves up to diverse views and in some cases just helped them think. However, we can do much more. This learning through stories cannot stop. We believe if we can get everyone to embrace the platform, together we can achieve far more. Why not open up the platform to everyone in a way where we tell each other stories which make all of us more aware, more informed, more conscious, more knowledgeable and helps each of us gain more skills ? As time has passed, this platform has grown from being that of one person to being of a small group of people to being of a large group of loyal users. Every passing day it becomes part of a community and the community becomes a part of it. InsideIIM.com calls itself the University of the Future. Our mission is to democratize access to quality management education. For far too long, management education in India has been elitist. Knowledge revolves within the small elite circles which resist any attempt to democratize access to that knowledge. For far too long, people have prospered because of this information asymmetry. There is rampant nepotism especially when it comes to jobs. So how do we solve this? Open up the platform to all! You would have seen the soft launch of the new features that we have rolled out over the last one month. We haven’t publicized them because we wanted to ensure we get a few basics in place first. Regular users who used the take a tour option would have seen it. We also informed business schools who had shown interest on becoming part of the community. Some schools have done an excellent job of writing very interesting stories already. It is now time for everyone to chip in. Every individual now has the choice to be a writer on InsideIIM and share knowledge. And, they can also get rewards for it!